At Alpine Ponds Event Center you get to choose each and every aspect of your wedding from what type of chair you would like down to the linen colors of the napkins. Once you decide what you would like, we set everything up from the tables, chairs, tents, dance floors, linens, lighting, etc., and at the end of the night take it all down for you too! All of our clients have the kind of stress-free day they have only dreamt about. We allow you to be you and do what you would like to do. After all... it's your day, not ours! Included with the venue reservation is exclusive access from 9am-12am, air-conditioned restrooms, beautiful bridal suite, trash cans and bags, and an Alpine Ponds representative. Our base prices are listed for 100 guests. If you will be having more then that, it goes up an additional $5 per person. Alpine Ponds has a maximum capacity of 200 guests. Our events on Monday thru Thursday are priced at $1,200, Friday and Sunday events are priced at $1,400, and Saturday events are priced at $1,600. Once again, the cost of each reservation is based on the guest count and do not include any rental items. 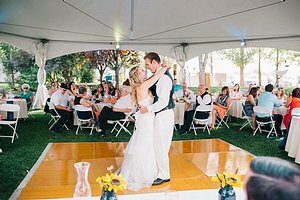 We do offer packages in addition to our base price, which include: tents, tables, chairs, linens, dance floors, decor services, dj entertainment, photobooth services, and full setup and takedown all of rental items! We are able to fully customize packages to include as much or as little as you would like! Contact us to get a custom quote based on your guest count. We can work with nearly any budget and layout so please give us a call so we can put together a quote for you. We even have partial day rentals for ceremonies! Give us a call at 208-859-2759 or shoot us an email at info@alpineponds.net. You can also use the links below to check date availability, book a tour and request information!